Surf and turf: a popular combo platter of culinary delights from land and sea. Well, the surf was definitely on at Jean Paul Gaultier’s FW11 menswear show – but so was the turf – and often in one outifit…a couture-esque combo platter. 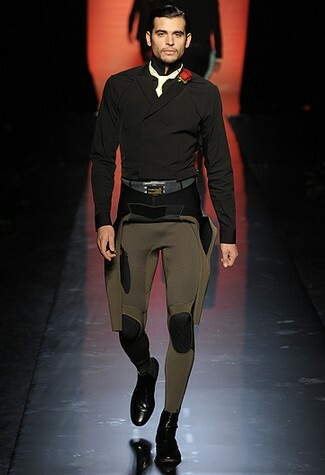 Multi-tasking wardrobe at Gaultier, FW11. Because you never know when you'll need a scuba suit! It, of course, instantly reminded me of Hamish Bowles from the June 2010 issue of Vogue – when Hamish went to surf camp (I know). The Surfing Sartorialist? Hamish Bowles, making fashion waves. De rigeur. JPG images courtesy of WWD.com. Hamish Bowles by Mario Testino, courtesy of Vogue.com.